Lower latency. 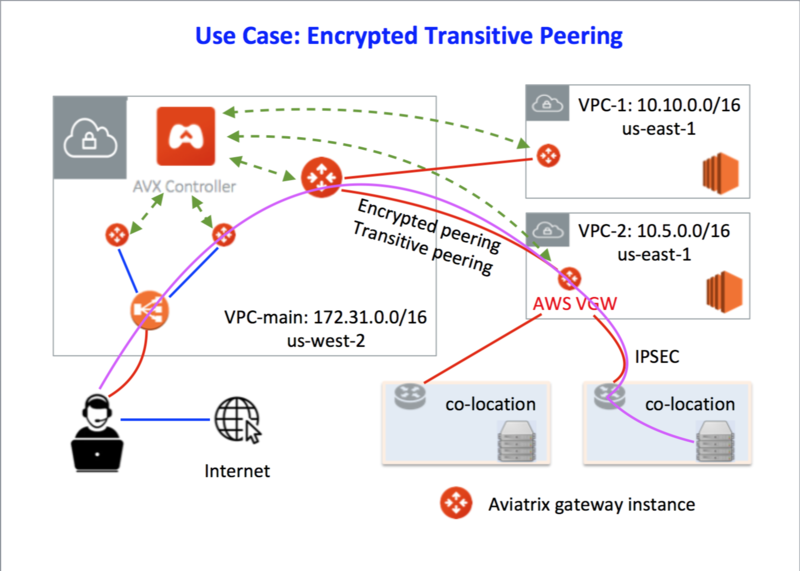 Rather than having your employees connect via VPN to your corporate office first and then access the cloud, provide a cloud VPN where they can access AWS directly. Better Security. Traditional VPN servers do not support modern multi factor authentication methods such as a combination of DUO Security, LDAP and OKTA. Few hardware gears to manage. However, your business may require hosting some critical applications in wide spread co-locations. As a cloud infrastructure engineer, you need to access these sites to check on the health of your servers and applications. The challenge is to setup a system to enable secure accessing abilities to both the cloud and co-locations. Our solution is to leverage Aviatrix’s encrypted peering and encrypted transitive peering capability to setup an end to end secure network. In this example, a datacenter or co-location hosts some critical customer facing applications. It connects to AWS VPC for additional processing, such as data analytics. The data center connects to a AWS VGW with IPSEC tunnel. Employees and developers access VPC-1 and VPC-2 directly via Aviatrix CloudVPN and encrypted peering configuration. The cloud infrastructure engineers need to access the servers in the datacenter or co-location for maintenance and monitoring purpose. They do so via an Aviatrix encrypted tunnel and Aviatrix encrypted transitive tunnel configuration. The solution diagram is shown below. We assume here that you have created a management VPC-main 172.31.0.0/16, its corresponding VPN gateways with ELB enabled. For more information for this part of configuration, check out this reference design. If you configure split tunnel mode for VPN gateways, make sure to include the co-location CIDRs in the additional CIDR field. The encrypted transitive peering configuration workflow is as follows, with major steps highlighted. At VPC Name 1 drop down menu, select the peering gateway launched in VPC-main (note, this peering gateway is different from the VPN gateway). At VPC Name 2 drop down menu, select the gateway launched in VPC-2. At Destination CIDR, fill in the destination CIDR of the co-location. For example, 10.12.0.0/24. Note this address should be unique across your network. Repeat the above step 3 for more co-locations. For feature request and feedback, click Make a wish at the bottom of each page.